Inform the person/company sending you money (the "remitter") to send the funds from the remitter's bank to PNB Tokyo Branch either (1) as credit to your deposit account with PNB Tokyo, or with any other Japanese banks or (2) as "Advise and Pay" (over the counter payment) at PNB Tokyo/Nagoya. If you want to receive the money at our counter (only in case your deposit account number with any bank including PNB Tokyo, is not specified in the payment instruction from the remitter's bank), be sure your remitter knows your correct address and telephone number. We will notify you through phone or by postal mail (the "notice") upon receipt of the payment instruction from the remitter's bank. Please bring with you your valid ID and the notice to claim the funds. In case your Japanese Yen deposit account number with PNB Tokyo is specified in the payment instruction from the remitter's bank, the proceeds of the funds will be paid into such deposit account in Japanese Yen after reduction of our handling/lifting charge. Please note that funds received in foreign currency other than Japanese Yen are automatically converted into Japanese Yen using our TTB rate (exchange rate for conversion of foreign currency into Japanese Yen) at the time of payment. In case your foreign currency deposit account number with PNB Tokyo is specified in the payment instruction from the remitter's bank, the proceeds of the funds will be paid into such deposit account without any conversion of currency. We accept payment instruction in US Dollars only if for credit to your US Dollar deposit account with PNB Tokyo. If your account number with other banks is specified in the payment instruction, we are unable to accept such payment instruction, and we will advice the same to the remitter's bank. 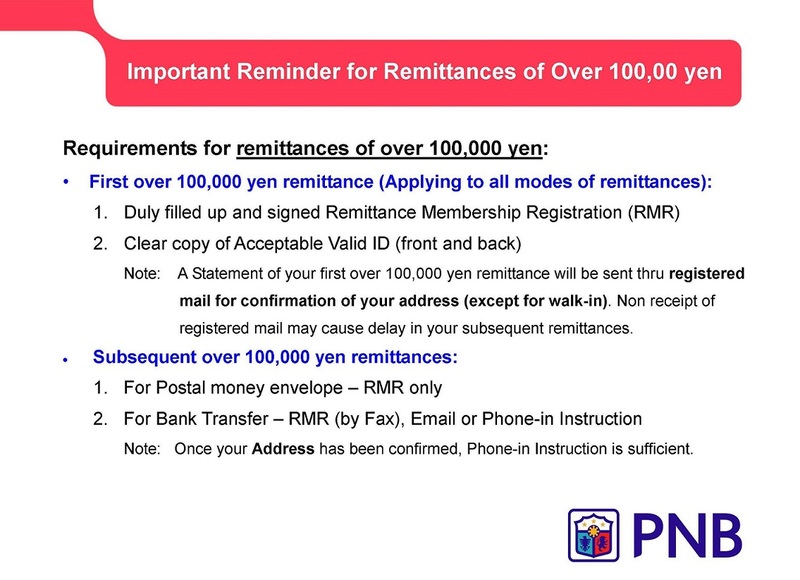 Note: Please instruct your remitter to send money by telegraphic transfer to PNB Tokyo. For more information about remittance, please feel free to contact us by phone or by email.